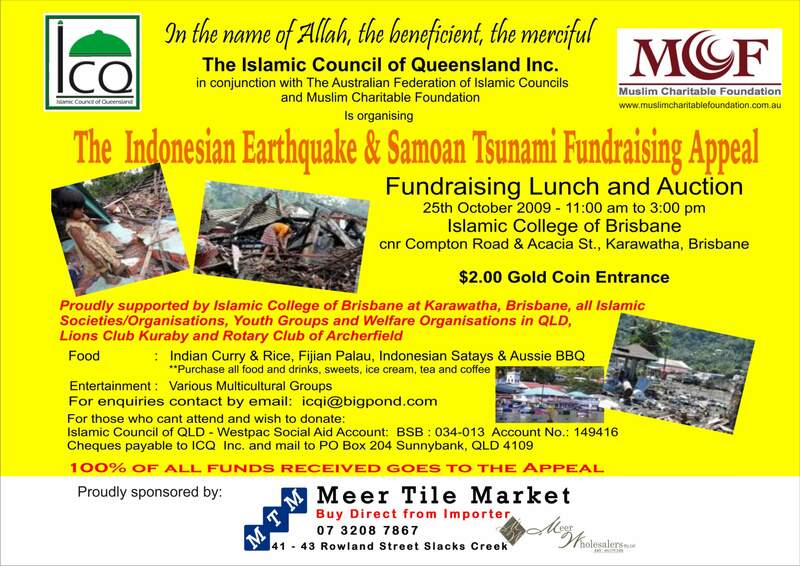 The Islamic Council of Queensland (ICQ) is co-ordinating a fundraising function to assist the victims of the earthquake in Indonesia and the tsunami in Samoa. Time : 11.00 a.m. - 3.00 p.m. 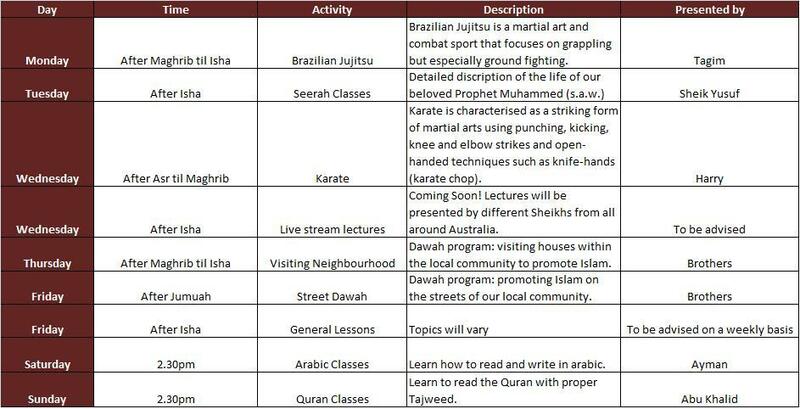 The ICQ has received very positive and widespread support for this event both from members as well as non members of ICQ and even some non�Islamic organisations. The ICQ is calling on all societies and organizations to join forces for this worthy cause. To plan and organize this event an interim committee has been formed by ICQ and representatives from all organizations are invited to join this committee. 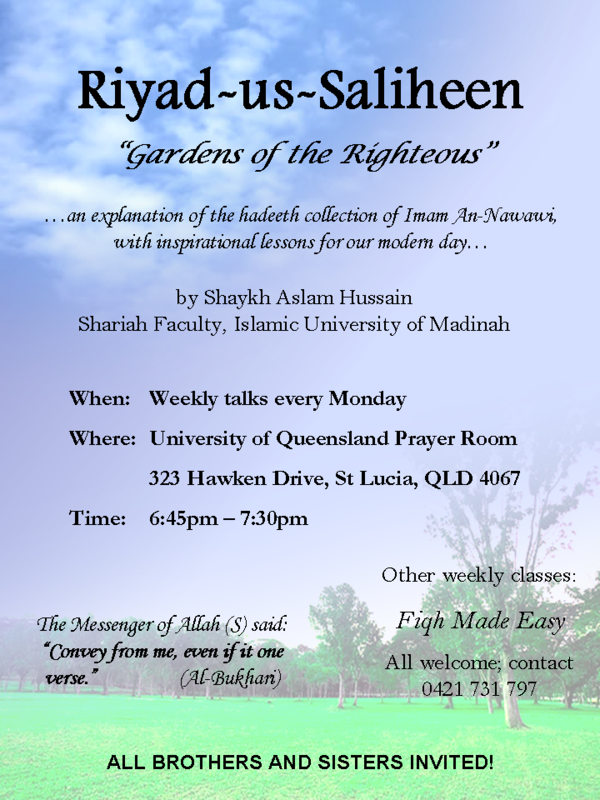 The next meeting of this committee will be on Tuesday 13th October at 7.00 p.m. at the Islamic College of Brisbane, Karawatha. 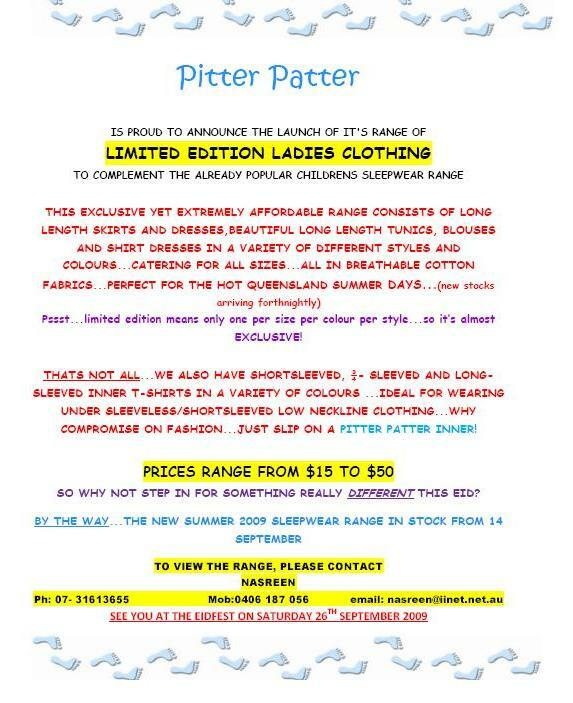 The Crescents of Brisbane's famous Coffee 'n Cupcake stall will be at the event. You can help us raise funds by simply baking as little as a dozen of your favourite cupcakes and dropping them of at 16 Fairview Close, KURABY or at the Crescents of Brisbane stall on the day. 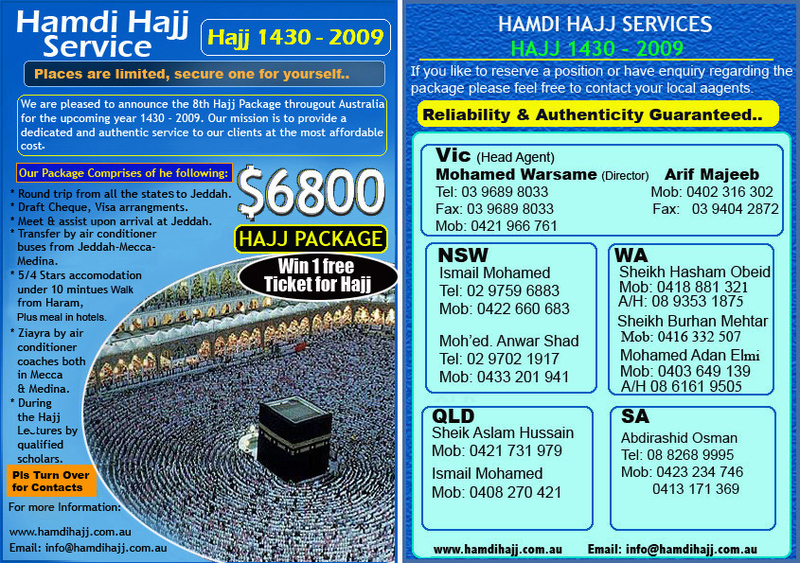 If you need any further information call Julie Hatia on 0417 786 220. At the AGM of the Islamic Council of Queensland (ICQ) held last Sunday, Mr. Mohammed Yusuf was elected the new President of the organization. Originally from Fiji, Mr. Yusuf is an accountant by profession but has now retired. In 1988 he was transferred to Papua New Guinea by the company he worked for and was the president of the Islamic Society of Papua New Guinea for many years. 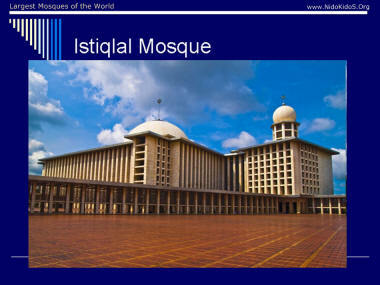 He was instrumental in acquiring the land and establishing the first Mosque in Port Moresby. 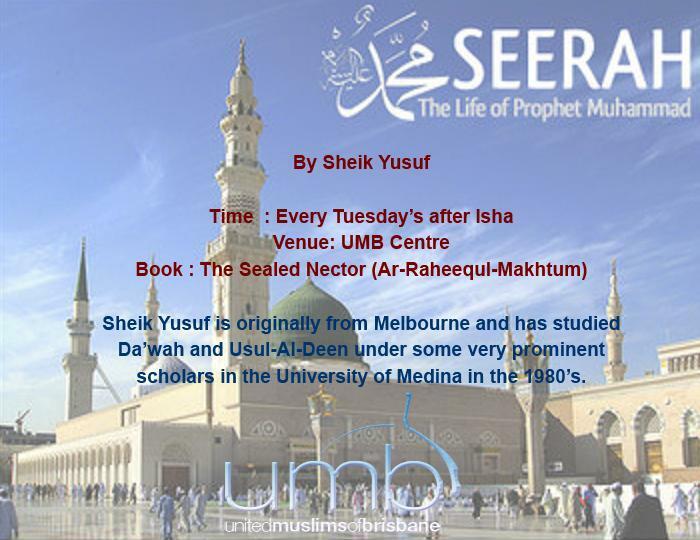 Mr. Yusuf migrated to Australia in 1994 and held the position of president of Islamic Society of Darra from 1998 to 2005. 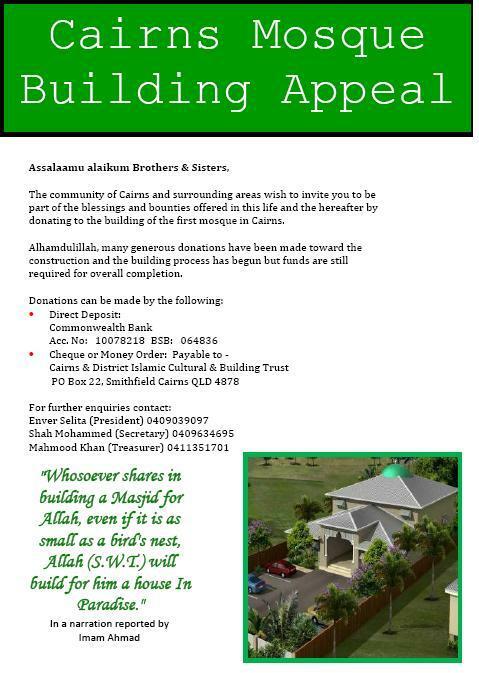 He led the team during the construction of current Darra Mosque at Oxley. 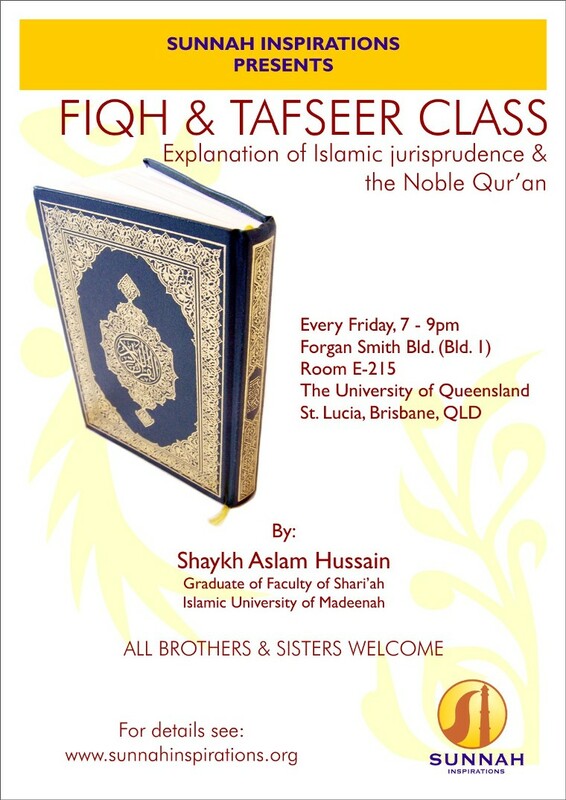 He has also been on the Board of the Islamic College of Brisbane for a number of years and is presently the Chairman of the School Board. Outgoing president, Mr. Suliman Sabdia, tabled a report, commissioned by the ICQ, that highlighted a number of issues concerning membership that the new committee would have to contend with in its future deliberations. In the early 1920s Leopold Weiss, a Viennese Jew, alienated by the materialism and spiritual emptiness of the West, travelled to the Middle East, visiting Jerusalem, Egypt, the Transjordan and Saudi Arabia. After studying the Koran, he left his Jewish roots behind, converted to Islam and changed his name to Muhammad Asad. Asad (1900-1992) became one of the most important Muslims of the 20th century, spreading its message of peace and brotherhood as a journalist and author of books such as Islam at the Crossroads, The Principles of State and Government in Islam and his autobiography, The Road to Mecca. He served as an advisor to the royal court of Saudi Arabia and was a co-founder of Pakistan and its Ambassador to the UN. The Ethnic Communities Council of Queensland has acknowledged the constructive efforts of Brisbane�s Somali community in organising a highly valuable forum with senior members of government, police and service agencies to talk about matters concerning the Somali community in Queensland. The forum was held during the week at Woolloongabba and was attended by over 100 people, including the Minister for Multicultural Affairs, Annastacia Palaszczuk, the Queensland Anti-Discrimination Commissioner, the State Director of the Department of Immigration & Citizenship, a senior Queensland Police Inspector representing the Commissioner for Police, a senior Courier-Mail journalist and many other community agency and political representatives. Mrs Agnes Whiten, Chair of Queensland�s peak body for ethnic communities and multicultural organisations, ECCQ, said the meeting was �extremely beneficial� and has already led to arrangements for a number of different follow-up meetings to address more specific needs and grievances amongst the Somali community. �A number of people from the Somali community in South East Queensland have experienced increased incidents of vilification and threats after publicity regarding the arrests of individuals of Somali background in Melbourne on terrorism-related charges,� Mrs Whiten said. �The meeting was important in ensuring government and community agencies are aware of the experiences of some of the Somali refugees now living in Queensland, and also in ensuring those who experience threats or racism know how they can get support,� she said. A meeting of Muslim community leaders, Imams and other individuals from around Queensland, including the Gold Coast, Logan, Kuraby and Darra, was held during Ramadan at the Kuraby Mosque. They met to discuss specific issues concerning allegations of police abuse and ethical standards toward the Muslim community which were raised after an incident occurred during Ramadan in Kuraby. 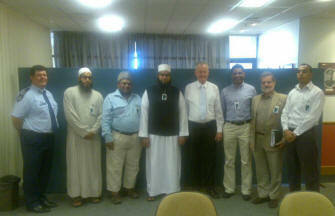 The meeting appointed a committee to meet with Police Commissioner, Bob Atkinson, (pictured left) with the members comprising Imam Ikraam Buksh, Sultan Deen, Imam Akram Buksh, Imraan Nathie, Dr. Daud Batchelor and Anas Abdalla. 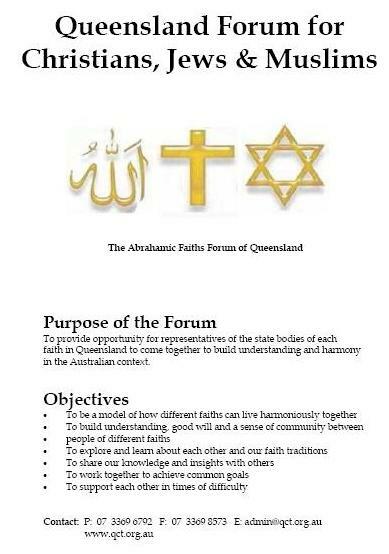 The delegates requested an investigation into the event that took place in Kuraby and a review of current working relationships with the Muslim community, the QPS and the Police Cross Cultural Liaison officer. A follow up meeting will be convened in four weeks time to address the findings of the investigation. The members of the steering committee will also establish an ongoing working group with the Commissioner�s office to address long term issues and strategies for the future. 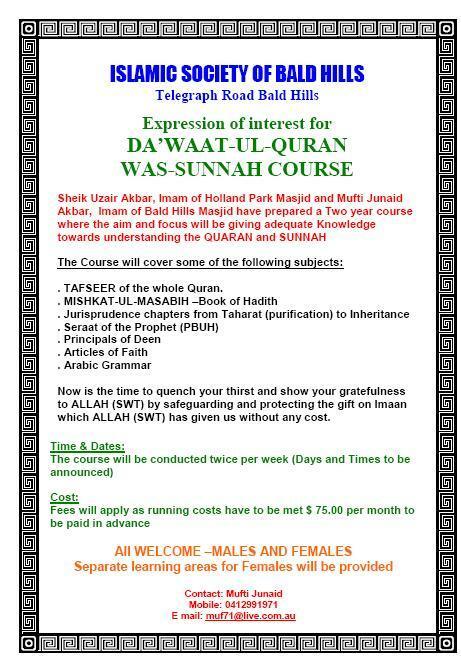 THE backers of an Islamic school at Carrara say they have a 'civic duty' to protect freedom of religion. That is why they have launched a two-pronged legal attack to try to get the school open for the start of the next school year. The battle involves mediation with the Gold Coast City Council as a precursor to a Planning and Environment Court hearing, as well as a new complaint to the Anti- Discrimination Tribunal. At the core of the issue are stringent conditions imposed on the Chisholm Road school, approved by councillors in February. They include building a footpath along the stretch of the school and handing over 20 per cent of the privately owned land to the council. There can also be no activity on weekends without one month's advance notice. School trustee Keysar Trad said Australia was known globally as the country that 'gave people a fair go' and said it was time the Islamic community got one. "We believe this application was treated with prejudice because of our Muslim faith," he said. "The case against the council is our civic duty to do something - we need to ensure no one else is discriminated against because of their religion. "We were originally reluctant ... but we have decided it is best to stand up for our rights." OFFICIALS behind an Islamic school earmarked for the Gold Coast say the local council is discriminating against them for being Muslim. The Gold Coast Islamic College, which had hoped to have opened its doors to students back in July, has lodged a complaint with the Anti-Discrimination Tribunal over concerns surrounding criteria the council wants satisfied before granting approval. The two parties are already headed to the Planning and Environment Court later this month, with papers also served to the discrimination tribunal last week. The controversial school, earmarked for land next to a Christian centre at Carrara, has polarised the Gold Coast, culminating in a racially fuelled protest rally late last year calling for the project to be scrapped. The council has already given preliminary approval to the school, but officials are unhappy at some of the demands, including road setbacks, the construction of a footpath and having to apply 30 days in advance before staging any weekend activities on-site. School trustee Keysar Trad said he could not see how the council could justify some of its demands. "We believe we are only being discriminated against because we are the friendly neighbourhood Muslims," he said. "We are at the mercy of someone at council. No other school has to meet these requirements." Gold Coast Mayor Ron Clarke said any notions of religious discrimination were ridiculous. "It doesn't matter what sort of school it is," he said. "The terms are the same for anyone. We had meeting after meeting with them to resolve this and we are not the ones who delayed it. They are." Despite the latest controversy over the school, Cr Clarke said he doubted it would spark a fresh wave of anger in the community. "I think the community has accepted the school now," he said. Mr Trad said the majority of Gold Coasters now supported the school and pointed to a Facebook support group which had almost 200 members, mostly from outside the Muslim community. The college hopes to open in time for the 2010 school year. 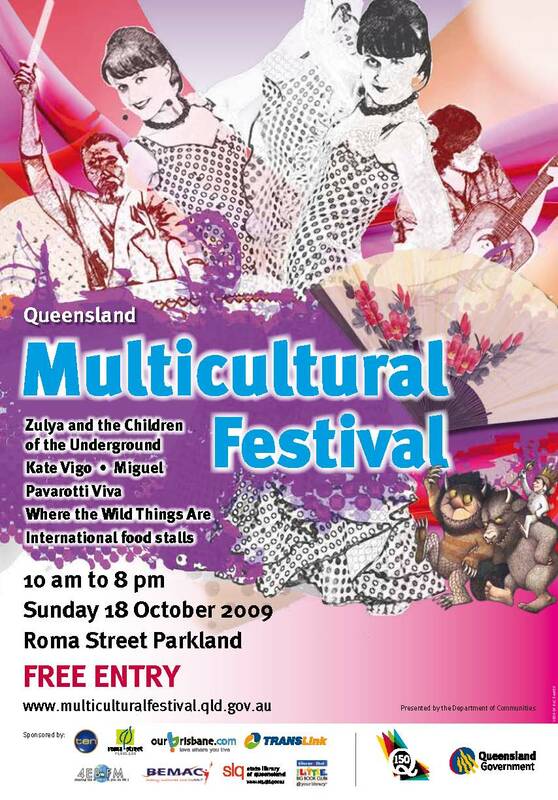 Queensland's largest, free, one-day community event takes place on Sunday 18 October from 10 am to 8 pm when the Queensland Multicultural Festival brings Roma Street Parkland to life. 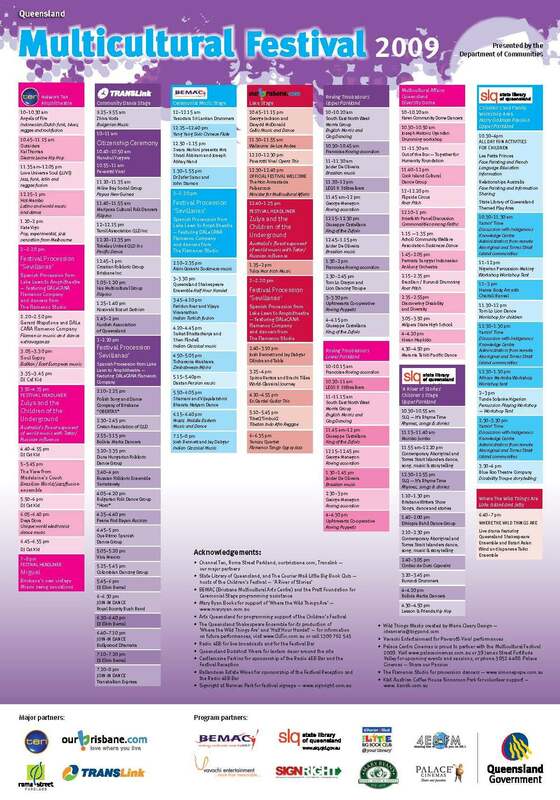 The 2009 program is a diverse programme offering a free and exciting day for people of all ages. 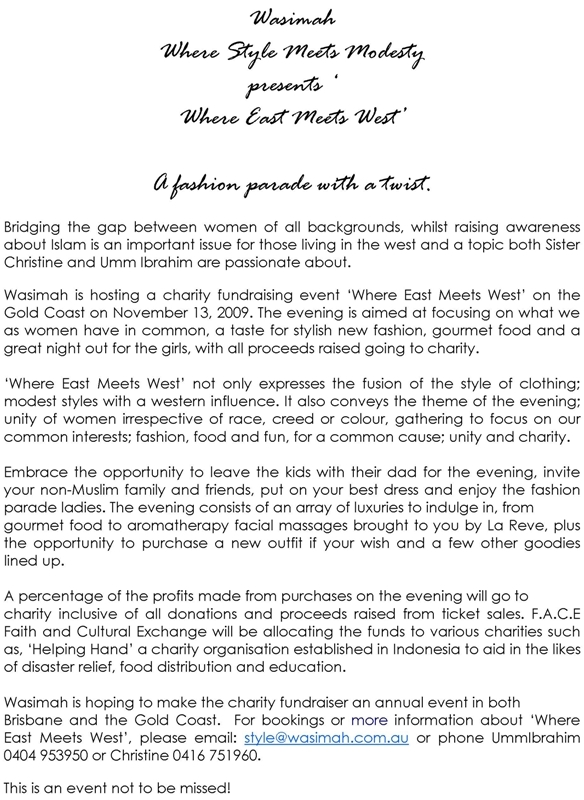 On the programme are Junaid Ally and Nadi Omarjee who will be MCing the proceedings in the Diversity Dome. Nora Amath will appear on the Interfaith Panel Discussion and Ahmad Ghazaleh will be part of the Out-of-the-Box presentation. 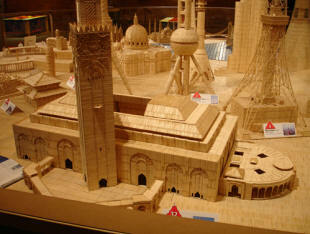 It took Stan Munro (38) 6 years to build his toothpick city. 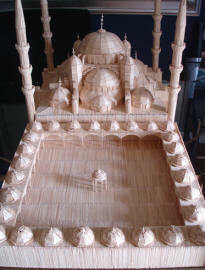 He used 6 million toothpicks and 170 litres of glue. 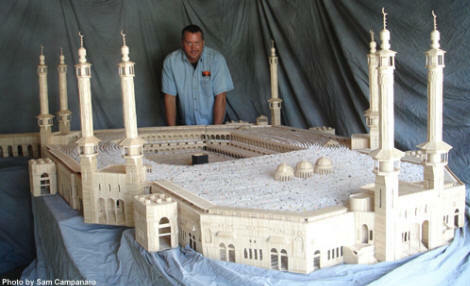 He can spend until 6 months to create a building and each of his creations is built to 1:164 scale. He works at the Museum of Science and Technology in Syracuse, New York (USA). Brisbane�s inaugural Palestinian Film Festival will screen prize-winning films films not readily available at cinemas or through video stores. Opening night films are Hicham Kayed�s Lemonade and Arna�s Children written and directed by Juliano Mer Khamis and Danniel Danniel. Second feature Arna�s Children is the moving story of a Jewish woman, Arna Mer, who set up a small theatre group of Palestinian children on the West Bank. Her son Juliano, who directed the group, traces the lives of the children after escalation of the Israeli-Palestinian conflict. Opening night will be a celebratory affair with food and live entertainment starting at 6.30pm and bookings are required. Head of the Palestinian Delegation to Australia Ambassador Izzat Abdulhadi will officially open the festival. Muraz Jan Kot�s Letter from Sarah is the story of a 12-year-old Palestinian girl to write a film script recounting her ordeal under the occupation. Palestine Blues directed by Nida Sinnokrot had its world premier at the 13th Annual New York Underground Film Festival. It is the sad story of the repercussions of the Israeli security wall and settlement expansion in the West Bank on Palestinians. Frontiers of Dreams and Fears directed by Mai Masri focuses on the children of the Shatila and Dheisha refugee camps. It captures the hearts and tears of audiences in an intense way. Mohammed Alatar�s Jerusalem: The East Side Story is about the Palestinian dispossession in East Jerusalem. Palestine, Summer 06 directed by Rowan Al Faqih and Nahed Awwad crosses between film, video art, and documentary to reflect the mood of the summer of 2006 when Israel carried out military assaults in Gaza and Lebanon. The compelling Arus el Jaleel (Bride of Galilee) is directed by Basel Tannous. Basel who worked for more than years to gain the trust of its subjects, Fatma and her family. The result is a painful and moving account of the encounters between two individuals on either side of the conflict. Gaza Strip documents the lives of ordinary Palestinians inside the Gaza Strip during the uprising of Palestinians against the Israeli occupation. The uprising is known as the intifada. Mohammad Bakri�s Jenin Jenin is a testimony from Jenin residents after their city and camp were flattened and scores of them killed. Palestinians and human rights groups accused Israel of committing war crimes in the April 2002 attack on the refugee camp. Director Mohammad Bakri�s Since You Left it is an autobiographical essay using archive footage, personal films, and documentary materials to account for the personal and political transformations that have occurred in Palestine as well as within his own thinking. Mohammed Alatar�s The Iron Wall reveals the official and unspoken policy of the Zionist movement and the state of Israel to use settlements to create a Zionist foothold in all of Palestine. The festival Palestinian Days is on October 16-18 at the Schonell Theatre at Queensland University at St Lucia. 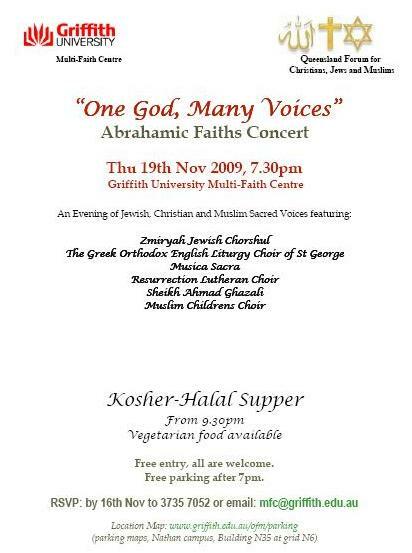 The Festival is jointly organized by Queensland Palestine Association Inc and Justice for Palestine Brisbane. 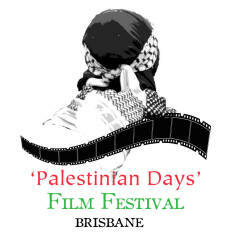 For screening times and to book visit www.justiceforpalestinebrisbane.org or phone Kathy on 0400 720 757. 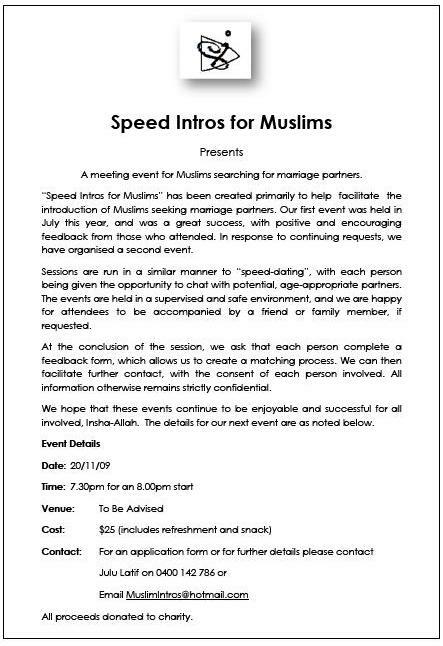 Imam Burhaan Mehtar, Imam of Thornlie Mosque in Perth and the Secretary of the Jamiatul Ulama Al-Islam of WA and Razia Mehtar are the proud parents of a delightful little baby girl. 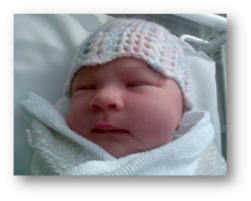 She was born on 17 October weighing in at 3.55kg and stretched out a full 56cm. The choice of a name for the new arrival is being forestalled by a raging debate in the family household. The Mehtars have three other children Usamah, Tameem and Muhammed Uwais. Only two weeks to go until the Crescents of Brisbane's "Celebration of being a Woman"
on Saturday the 24 October at the Sunnybank District Baptist Church Hall (Cnr Brandon & Nemies Rd, Runcorn) from 11am until 3pm. The program includes a delicious 2 course meal, talks by a life coach, fitness expert and body image consultant and to finish off the day, a performance from a South American ladies dance fitness group. Guests will also be treated to mini-facials, mini-makeovers and product demonstrations from the girls of Galvanic Spa, Larissa Bright Cosmetics and Beauty Spells Mineral Makeup. 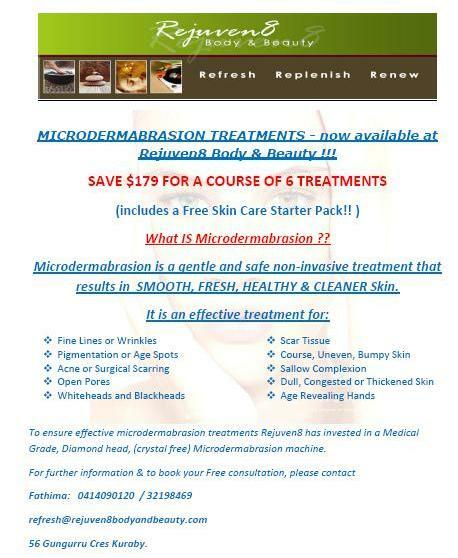 Each guest receives an individually hand-crafted memento of the occasional as well as a generous $40 gift voucher redeemable when booking a 1hr facial or body treatment with the renowned upmarket Goodmorning Babylon Skin & Day Spa Centre in Milton. Some of the prizes for the lucky draw include a Goodmorning Babylon La Prairie Caviar facial treatment worth over $200, spa relaxation kits, makeup and cosmetic gift vouchers. 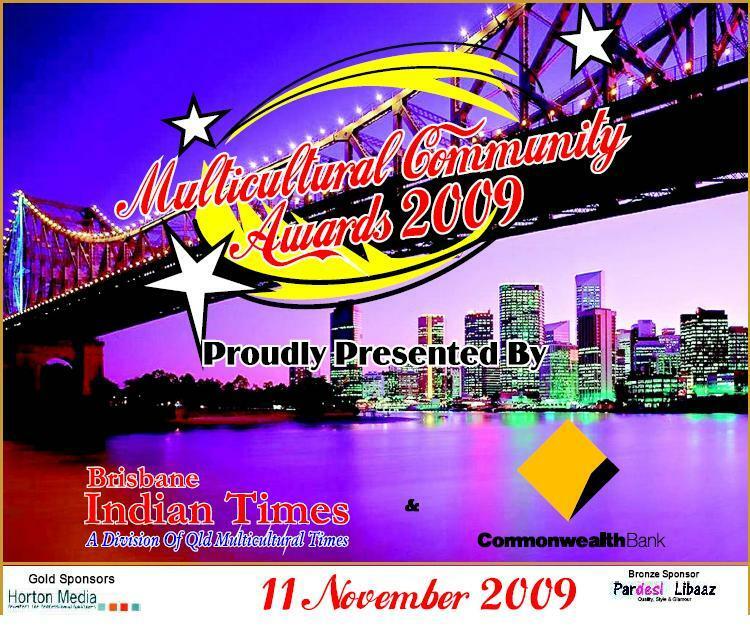 Each year the Brisbane Indian Times hosts its Annual Awards to celebrate the achievement of individuals and businesses (based in Queensland) across various categories. The awards have become very popular over the past 6 years and BIT Editor, Trudi Tarres, told CCN that the events have become a favourite in Brisbane�s social calendar. 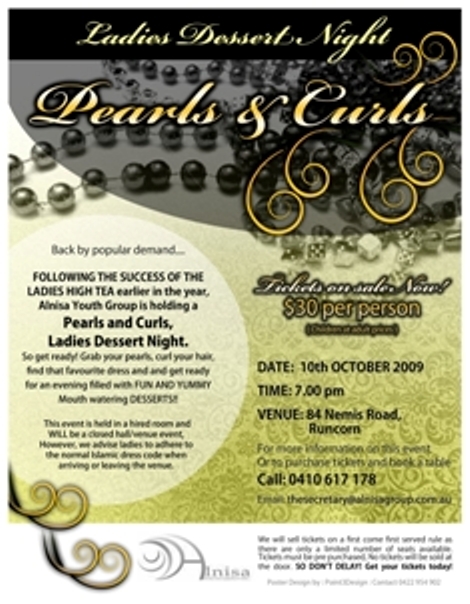 This year the Commonwealth Bank 2009 Multicultural Community Awards presentation will be held at Coffee Club Auditorium, RNA Showgrounds on Wednesday 11 November 2009. Some 500 are expected to attend the night. 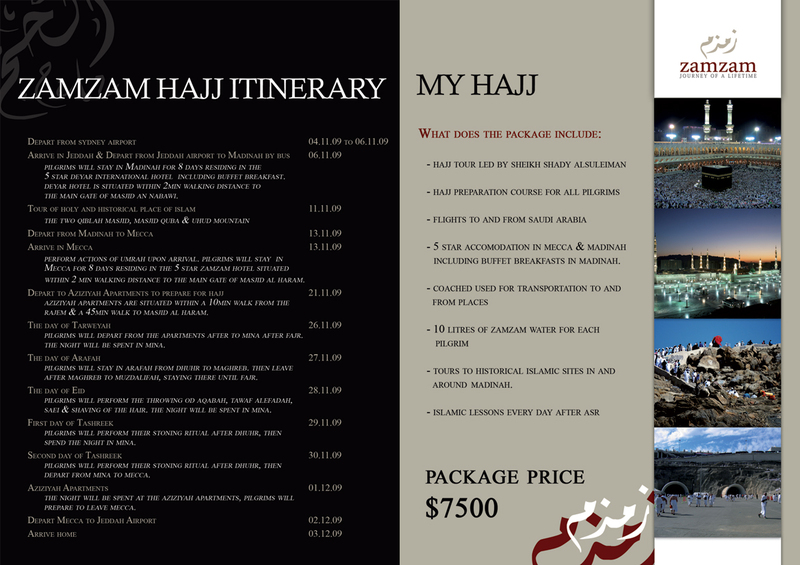 Guests will include businessmen, politicians, community leaders and various other distinguished individuals. Ms Tarres told CCN: "It would be fantastic to receive nominations from your readers. The awards are open to all businesses (groups and individuals), they do not have to advertise with us. I think some people believe that in order to win you have to do so!". Omar Issadeen (pictured left) makes an impassioned point on cultural diversity at the recently held 2020 Southside Summit at the Griffith University. The Summit, initiated by Federal Member for Moreton, Graham Perrett MP, was attended by school and university students, police officers, teachers, business owners, union delegates, local councillors, state parliamentarians, migrant and indigenous community leaders and local residents. Nearly 200 people came to debate and discuss some of the challenging issues confronting the community. One recommendation that came out of the deliberations of the Cultural Diversity Forum was the need to establish a multicultural reference group in the area to continue the dialogue and advise government representatives. Other ideas included addressing racism in law enforcement agencies; providing further education to officers on the wide range of cultures in the Southside; and developing a curriculum for schools to raise awareness of multiculturalism and overcome inherent prejudices. 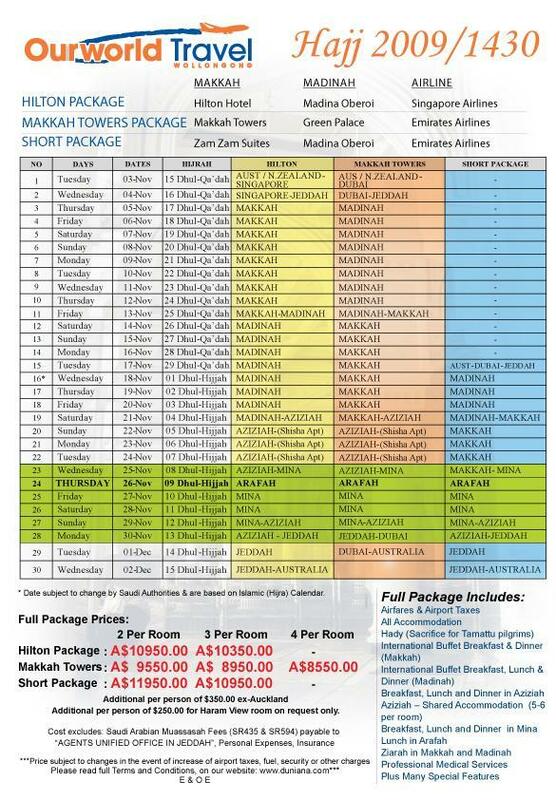 The Australian International Islamic College (AIIC) was involved in two functions during the school holiday break. Click on the image to read all about them. Many people spend their lives considering big questions about the meaning of life and the existence of God. On ABC's Q&A, a fortnight ago, the panel discussed these very questions. On the panel were: one of Australia's leading Catholic intellectuals, Father Frank Brennan; renowned journalist and atheist, Christopher Hitchens, who is in Australia to deliver the opening address at the Festival of Dangerous Ideas; social commentator and founding editor of The Monthly, Sally Warhaft; and politics lecturer and former spokesman for the Islamic Council of Victoria, Waleed Aly; and Deputy director of the Sydney Institute, biographer and commentator, Anne Henderson. Watch the episode and read the transcript. There are 1.57billion Muslims around the world, meaning that nearly one in four people practises Islam, according to a report published yesterday. The size of the Muslim population has long been the subject of guesswork, with estimates ranging anywhere from one billion to 1.8billion. But the report, by the Pew Research Centre's Forum on Religion and Public Life, is billed as the most comprehensive of its kind. The project, which has taken three years, presents a portrait of the Muslim world that might surprise some. For example, Germany has more Muslims than Lebanon, China has more than Syria, and Russia has more than Jordan and Libya combined. Britain has 1,647,000 Muslims - 2.7 per cent of the UK population, and 0.1 per cent of the global Muslim population, the report said. Islam is the world's second largest religion behind Christianity, which has an estimated 2.1billion to 2.2billion followers. The Pew centre, an American think-tank, calls the report the most thorough on the size and distribution of Muslims. The task of determining the Muslim populations in 232 countries and territories involved analysing census reports, demographic studies and general population surveys. 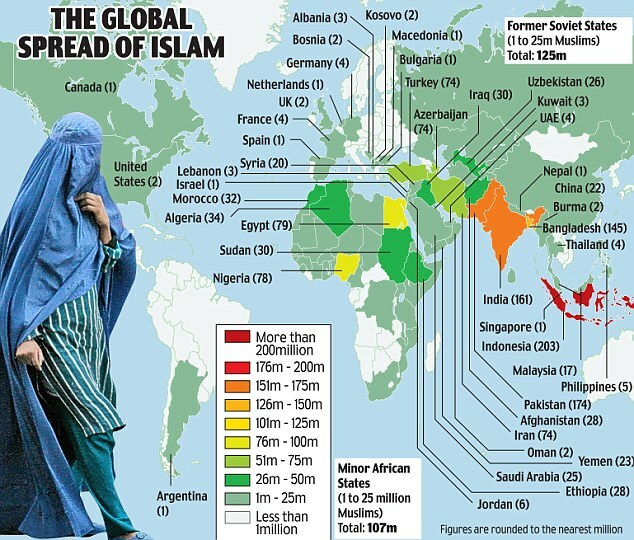 The report provides further evidence that while the heart of Islam might beat in the Middle East, its greatest numbers lie in Asia - more than 60 per cent of the world's Muslims live in Asia. Indonesia has the world's largest Muslim population - 203million, or 13 per cent of the world's total. About 20 per cent of Muslims live in the Middle East and North Africa, 15 per cent in Sub-Saharan Africa, 2.4 per cent in Europe and 0.3 per cent in the Americas. Europe is home to about 38million. The report made no reference to whether the Muslim population is on the increase. 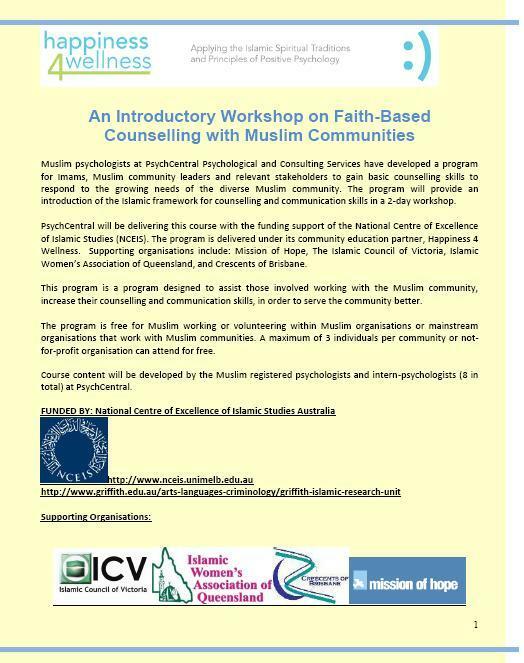 A Pew centre project next year will estimate growth rates among Muslim populations and project future trends. Europe is home to about 38 million Muslims, or about five per cent of its population. Germany appears to have more than 4 million Muslims - almost as many as North and South America combined. In France, where tensions have run high over an influx of Muslim immigrant laborers, the overall numbers were lower but a larger percentage of the population is Muslim. Two-thirds of all Muslims live in 10 countries. Six are in Asia (Indonesia, Pakistan, India, Bangladesh, Iran and Turkey), three are in North Africa (Egypt, Algeria and Morocco) and one is in sub-Saharan Africa (Nigeria). Indonesia, which has a tradition of a more tolerant Islam, has the world's largest Muslim population (203 million, or 13 per cent of the world's total). Religious extremists have been involved in several high-profile bombings there in recent years. In China, the highest concentrations of Muslims were in western provinces. The country experienced its worst outbreak of ethnic violence in decades when rioting broke out this summer between minority Muslim Uighurs and majority Han Chinese. Of roughly 4.6 million Muslims in the Americas, more than half live in the United States although they only make up 0.8 percent of the population there. About 700,000 people in Canada are Muslim, or about two percent of the total population. 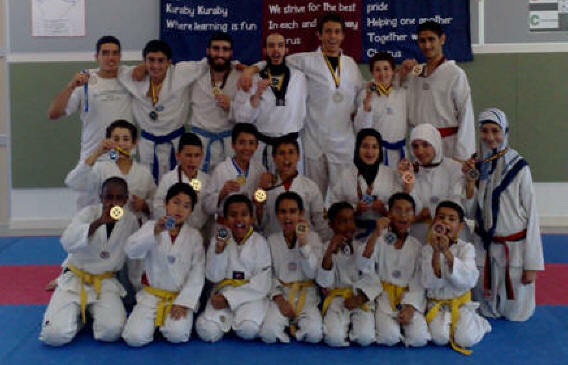 On the weekend of the third and fourth of October, Ramis Thunder Taekwondo Club along with David Kings Taekwondo Academy sent a team of competitors to the Australian Taekwondo Open at Sleemans Sports Complex in Brisbane. This is the first time the nationals was played in Brisbane since 2003 so it was a chance to send a large team so the competitors could learn from the experience. Over 2500 competitors came from around Australia and from overseas including countries from New Zealand and Samoa to compete and enjoy the great Brisbane climate. To qualify for the nationals, the competitors had to compete in the Queensland Open and Queensland Selection which was fought on the 22nd of March and the 26th of July. The top three from the two tournaments, were selected for the nationals. The clubs sent a team of 30 students, the largest team ever sent by the clubs. Day one saw all the colour belt competitors compete, with the competition starting at 9am and going through till 9pm. The next day saw all the black belts competing with the day beginning at 9am and going through till 7pm. It was two long but exciting days with a chance of family and friends able to watch the students fight and at the same time cheer them on. Most weren't disappointed with what they saw, with the final medal tally over the two days reaching nine gold, six silver and a further nine bronze. For those that won gold, they are now national champions. The Islamic Women�s Association of Queensland will receive an extra $25,000 to support older people living independently in their own homes under the Commonwealth State Home and Community Care (HACC) program. Member for Moreton Graham Perrett (pictured right) said the extra HACC funding would deliver improved services to older people and their carers. �People want to remain independent, and in their own homes and communities for as long as they can,� Mr Perrett said. 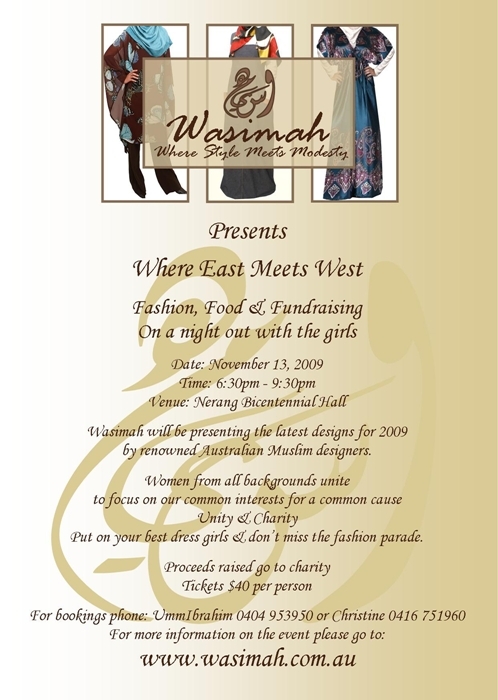 Mr Perrett said the Islamic Women�s Association of Queensland would receive an extra $20,000 towards their operating costs and $5,000 to purchase a wheel chair hoist for their bus. 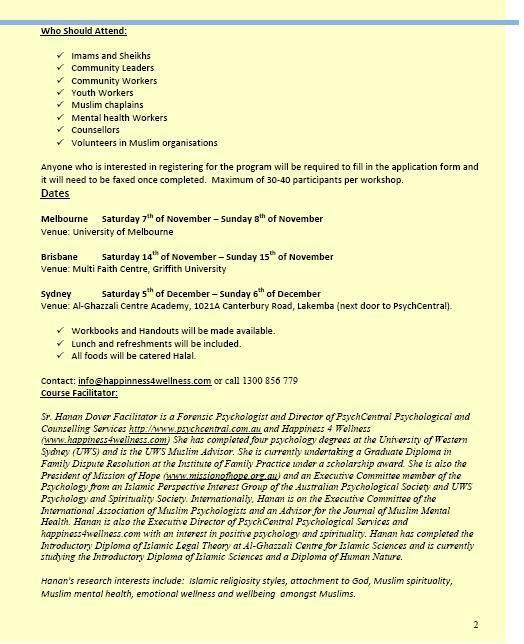 �I�m pleased that the Islamic Women�s Association of Queensland will receive this additional funding to help support the great work they do here on Brisbane�s southside,� he said. Home and Community Care (HACC) is a joint Australian and state and territory government program that delivers affordable and accessible care to help meet the individual needs of older people, and their carers. Services include help with household chores, home maintenance and modification, transport, meals, personal care and allied health and nursing care. 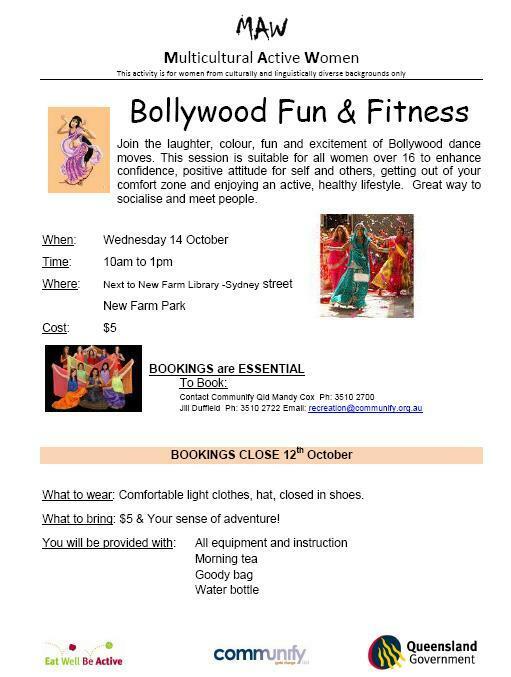 Join the laughter, colour, fun and excitement of Bollywood dance moves. This session is suitable for all women over 16 to enhance confidence, positive attitude for self and others, getting out of your comfort zone and enjoying an active, healthy lifestyle. 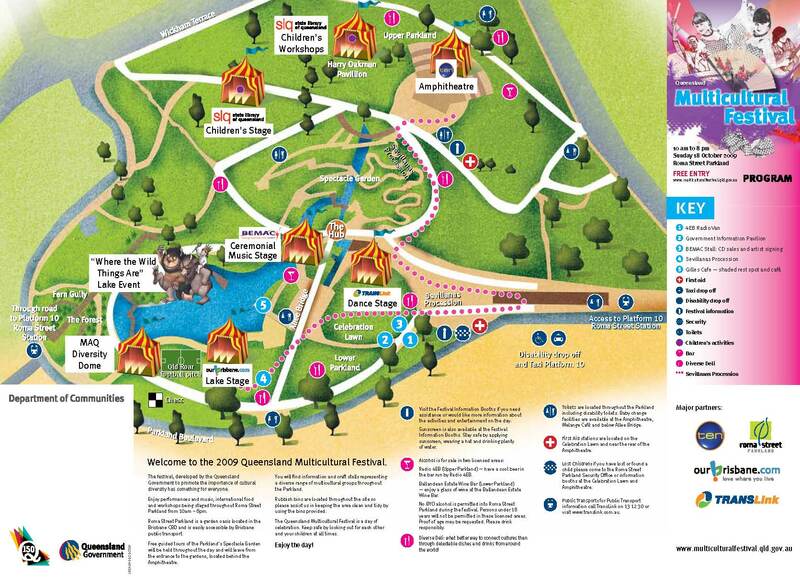 Great way to socialise and meet people. Irshaad and Naadiya Karim are a recently married young couple taking on the challenge of starting their own business. They are freelance designers in Perth and Brisbane specialising in Interior design. 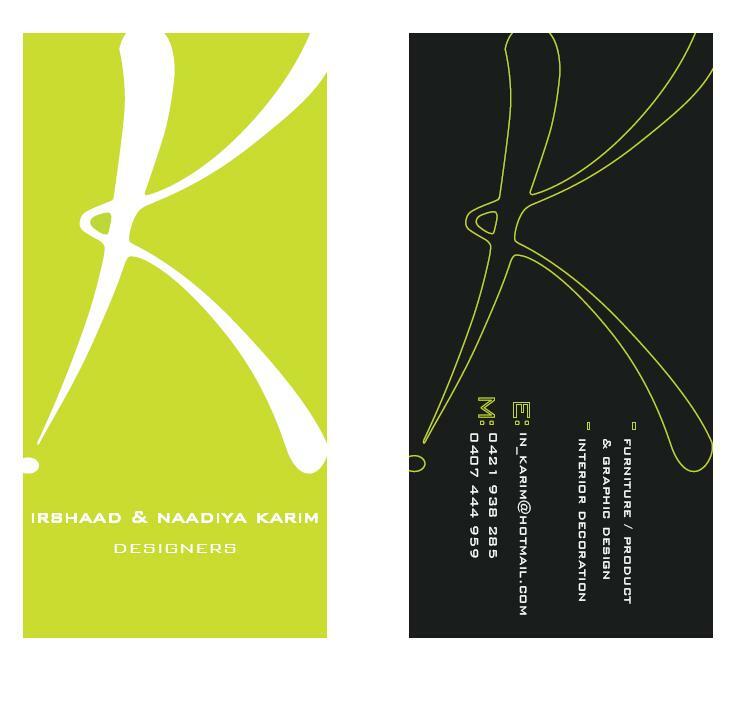 Irshaad has a Certificate IV in Industrial Design (Product & Furniture Design) and Naadiya has a Diploma in Interior Decoration. They have helped do two interiors for Nandos one here in Brisbane and one in Melbourne. They recently helped a family member design and decorate their new house situated in Perth and offer free initial consultations with no obligations attached. Their services include paint selections, furniture selections, advice on "revamping your interior" with their ongoing support throughout the project and many more. 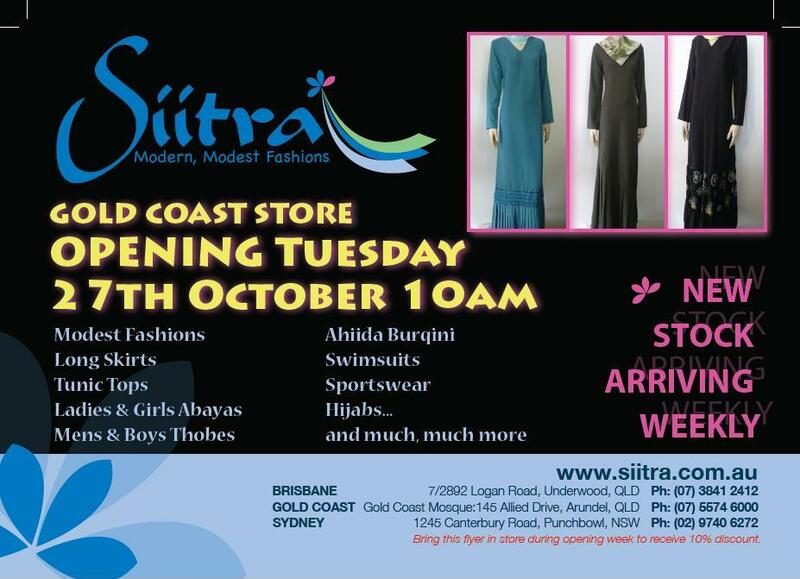 Their contact details are 0421 938 285 and 0407 444 959 and email is in_karim@hotmail.com. ITALIAN mobsters, Arab terrorists, Japanese businessmen and American heroes. That's how the stereotypes go in Hollywood and comedian Maz Jobrani is bored with the lot of them. To help balance things out, the Iranian-American stand-up is breaking down racial cliches with sharp wit, funny stories and clever observations. "Unfortunately when you see Arabs and Middle Easterners in the press or movies or anything like that it tends to be us being violent, being terrorists, being without humour," he says. "Every time they show us on TV they always show the crazy guy burning the flag going 'Death to America!' Just once I wish they would show us, I don't know, baking a cookie. Just once I want them to go to Mohammed in Iran and show some guy who goes 'Hello, I'm Mohammed and I'm just baking a cookie. Back to you Bob'." With great comic timing, good humour and an upbeat stage presence, Jobrani, 37, makes equal fun of Iranians, including himself, and the limited views people have of them. Lately he has been doing material on the Iranian election. "I'm trying to make fun of the line that the regime's taken and make a point at the same time," he says. "In breaking it down on some of my shows I've been saying that it seems in a country of 70 million people, Ahmadinejad got 75 million votes." Born in Tehran, Iran, Jobrani fled Iran with his family when he was six years old during the revolution of 1978-79. Raised in San Francisco where he says he learnt his liberal views, he went on to complete a BA in political science and Italian, spending a year studying in Italy. With the idea of becoming a university professor, he started a PhD in political science at UCLA before dropping out at 26 to pursue his dream of performing. "I was working in an advertising agency as an assistant and I decided I wanted to do this. There was an older gentlemen there who'd seen a video of a play I'd done � I was doing plays as a hobby on the side � and he told me when he was in his 20s there were some things he wanted to do. He never got around to doing them and now he's 60 and he hasn't done them yet. It was a light-bulb moment," Jobrani says. His family, who originally wanted him to be a lawyer, thought he was crazy. "They wanted me to have a secure job. My mum first started thinking I was crazy when I came back from Italy to be a professor and when I said I wanted to get into acting I think she looked at me and thought I'd lost my mind," he says. Now she is his biggest fan. In 2005, Jobrani joined the Axis of Evil comedy tour featuring Middle Eastern-American comics. The following year he did a stand-up routine on The Tonight Show with Jay Leno, paving the way for television roles on both comedy and drama series including Malcolm in the Middle, The West Wing, NYPD Blue, Without a Trace, ER, Law and Order and Curb Your Enthusiasm. As well as performing at the first comedy festival in the Middle East in Jordan last year and the Arab-American Comedy Festival in New York, Jobrani has toured his solo show across the Middle East, Sweden, London, Europe and Australia and plays his first Brisbane gig later this month. Haneef: A Question of Character by Jacqui Ewart (pictured left) will be launched by Rafael Epstein ABC journalist at the Melbourne Hotel, 10 Browning St, West End on Tuesday 20 October at 5.30pm. MALAYSIAN Opposition Leader Anwar Ibrahim has offered some insight for the US on dealing with the Muslim world: highlight successes, fund education, and do not fear openly debating radicals. But Dr Anwar said that Muslim nations must also initiate reforms in response to US President Barack Obama's landmark June 4 speech in Cairo extending a hand to the Islamic world. "Reform and democracy are critical to the Muslim world," Dr Anwar, whose opposition alliance posted its best-ever performance last year, said at the Brookings Institution, a Washington think-tank. US officials should highlight the positives in the Muslim world, he said. Dr Anwar pointed to progress in Muslim-majority democracies such as Indonesia and Turkey and said the West largely ignored the wide condemnation by even the most conservative Muslim clerics of July suicide bombings at Jakarta luxury hotels. The West should also be careful with labelling Muslims, he said. "I pray, I fast, I don't drink... am I a fundamentalist? I don't know," Dr Anwar said. He said that aspects of Islamic Sharia law can be tolerated as long as they do not curtail human rights or discriminate against women, and that media coverage focused on radicals' actions only encouraged them. Instead, they should be allowed to speak, he said. "You deal with them through education and a free media," he said. "My honest view is that the fringe, fanatical elements cannot stand to reason." As for the US role, Dr Anwar said an investment in training maths, English and computer science teachers could have tremendous influence in places like Pakistan in quieting the more radical voices. The US Congress last week approved a five-year, $US7.5 billion ($8.4 billion) aid package for Pakistan, a frontline nation in Obama's campaign against Islamic extremism. Dr Anwar's three-party alliance, which brings aboard conservative Muslims and liberal Chinese, won a third of parliamentary seats last year and is vying to unseat the Barisan Nasional coalition that has ruled Malaysia for half a century. Mohamed Sayed Tantawi, Grand Sheikh of the al-Azhar mosque in Egypt, this month ordered a schoolgirl to remove her niqab (Islamic veil), whilst visiting a School. The influential cleric later decided to ban the wearing of religious attire in all educational institutions under his tutorship. 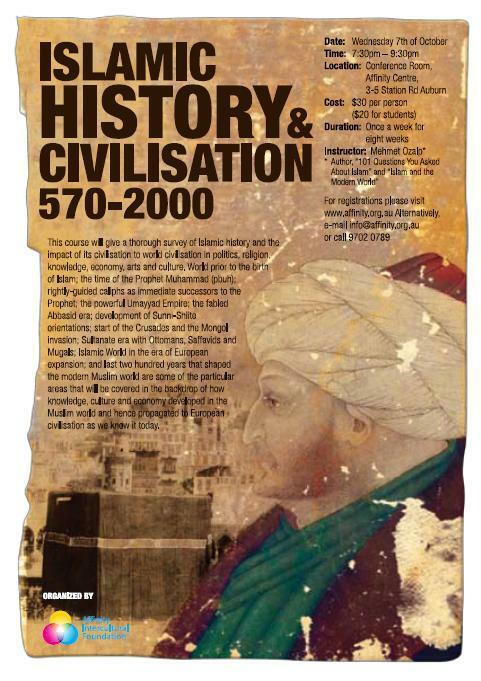 It is believed that this is the first such case in the history of the Muslim world. It is a "religious tug-of-war that is as much a question of regional politics as of doctrinal interpretation," argues The National, a United Arab Emirates newspaper. Within the first few paragraphs of this extraordinary and beautifully written autobiography, the reader recognizes s/he is immersed in a timeless spiritual classic. The grandson of a Central European Orthodox rabbi, Asad yearned for a life without the "carefully contained, artificial defenses which security-minded people love to build up around them," where he could find for himself "an approach to the spiritual order of things." He found his first "quiet gladness" in Taoism, only regretting this "ivory tower" could not be lived in. Against his father's wishes, he left the pursuit of a doctorate in Vienna to take up journalism. His fascinating travels took him to Jerusalem, Arabia, and India, and finally into service at the United Nations. In 1926, Asad embraced Islam. His account of his years in Arabia, his desert adventures, friendship with King Saud, and marriage there is truly gripping. "Trenchant with adventure magnificently described, and a commentary upon the inner meaning of Arab and Moslem life, helpful to all who would achieve a more accurate understanding of the Arabs and their lands." This pickle will will enhance any dish as an accompaniment, and is even great between two slices of bread. Dear Kareema, you've mentioned before that our diet is even more important than our exercise routine. Can you give us some pointers on trying to stick to a healthy diet? (bran or oats) as these are the foods you will put into your body on a daily basis! Mula Nasruddin, the Imam of the local Mosque, was opening his mail one morning. Drawing a single sheet of paper from an envelope, he found written on it only one word: "FOOL." The next Friday before the Jumma Khutbah he announced, "I have known many people who have written letters and forgot to sign their names. But this week I received a letter from someone who signed his name and had forgotten to write a letter."